I am very excited to participate as a speaker in the workshop on Big Data and Machine Learning organized by European Association of Geoscientists & Engineers. My presentation is about using machine learning and deep learning to advance seismic interpretation process for the benefit of hydrocarbons exploration and production. Companies in the oil and gas industry invest millions of dollars in an effort to improve their understanding of their reservoir characteristics and predict their future behavior. 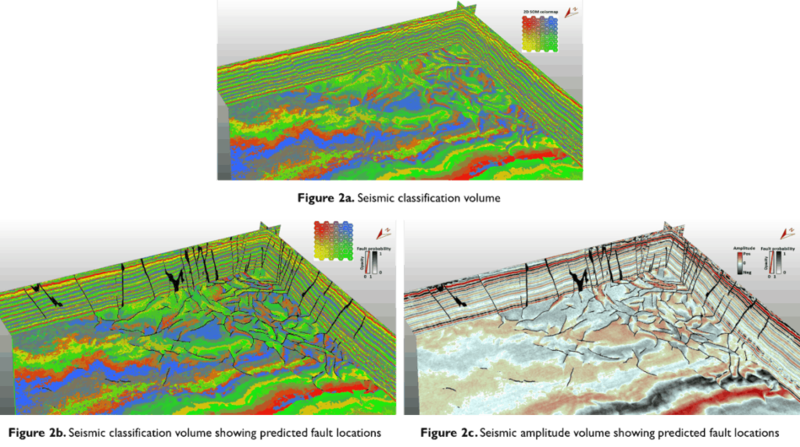 An integral part of this effort consists of using traditional workflows for interpreting large volumes of seismic data. Geoscientists are required to manually define relationships between geological features and seismic patterns. As a result, the task of finding significative seismic responses to recognize reservoir characteristics can be overwhelming. In this era of big data revolution, we are at the beginning of the next fundamental shift in seismic interpretation. Knowledge discovery, based on machine learning and deep learning, supports geoscientists in two ways. First, it interrogates volumes of seismic data without preconceptions. The objective is to automatically find key insights, hidden patterns, and correlations. So then, geoscientists gain visibility into complex relationships between geologic features and seismic data. To illustrate this point, Figure 1a shows a thin bed reservoir scenario from Texas (USA). In terms of seismic data, it is difficult to discern the presence of the seismic event associated with the producing zone at well location. The use of machine learning to derive a seismic classification output (Figure 1b) brought forward a much rich stratigraphic information. Upon closer examination using time slice views (Figure 1c), it is indicated that the reservoir is an offshore bar. Note how well oil production matches the extent of the reservoir body. Figure 1. Seismic classification result using machine learning (result provided by Deborah Sacrey, senior geologist with Geophysical Insights). 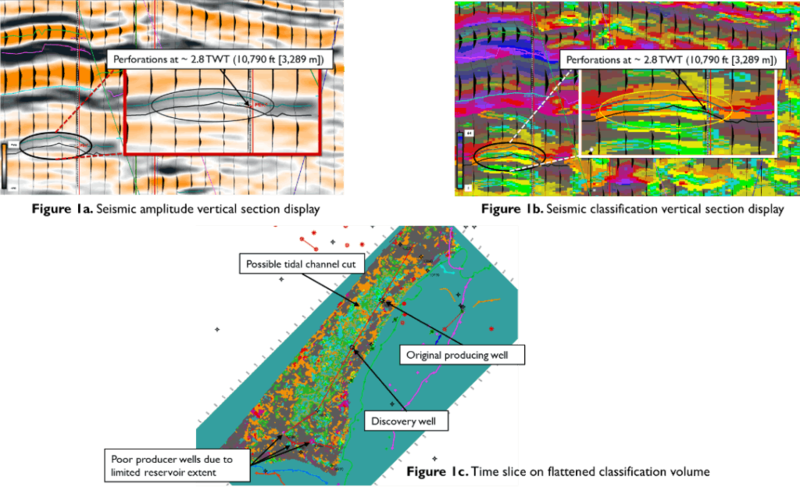 Another way knowledge discovery can help geoscientists is to automate elements of seismic interpretation process. At the rate machine learning and deep learning can consume large amounts of seismic data, it makes possible to constantly review, modify, and take appropriate actions at the right time. With these possibilities, geoscientists are free to focus on other, more valuable tasks. The following example demonstrates that a deep learning model trained can be trained on seismic data or derived attributes (e.g., seismic classification, instantaneous, geometric, etc.) to identify desired outcomes, such as fault locations. In this case, a seismic classification volume (Figure 2a) was generated from seismic amplitude data (Taranaki Basin, west coast of New Zealand). Figure 2b shows the predicted faults displayed against the classification volume. To corroborate the quality of the prediction, the faults are also displayed against the seismic amplitude data (Figure 2c). It is important to note that the seismic classification volume provides an additional benefit to the process of seismic interpretation. It has the potential to expose stratigraphic information not readily apparent in seismic amplitude data. Figure 2. Fault location predictions using deep learning (result provided by Dr. Tao Zhao, research geophysicist with Geophysical Insights).